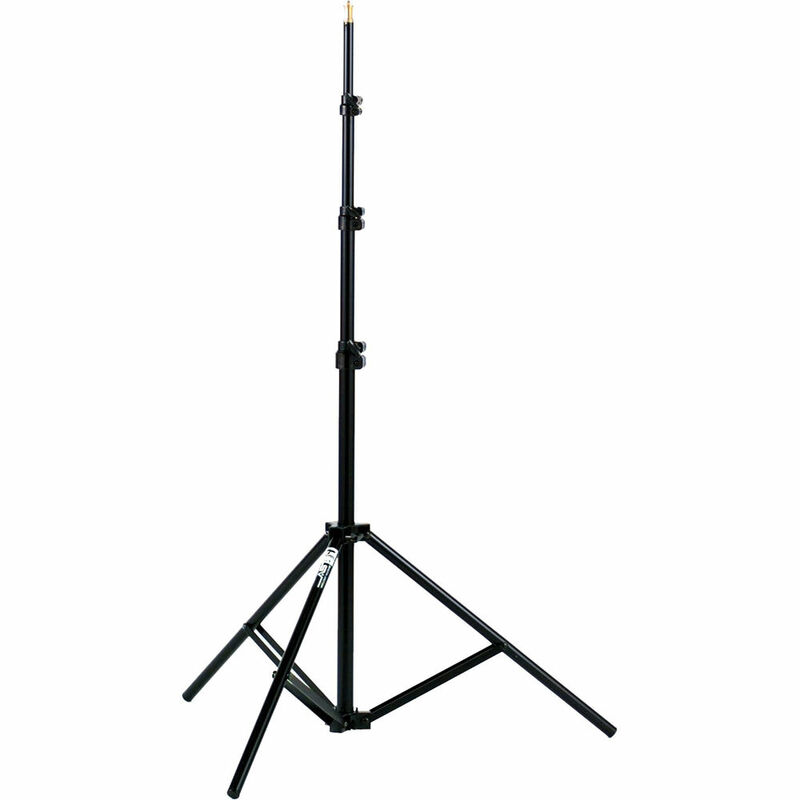 This 8' Smith-Victor RS8 Aluminum Light Stand has a 5/8" top stud, is lightweight and built to last. Tubular bases with wide footprint diameters provide ample support for your lighting equipment. 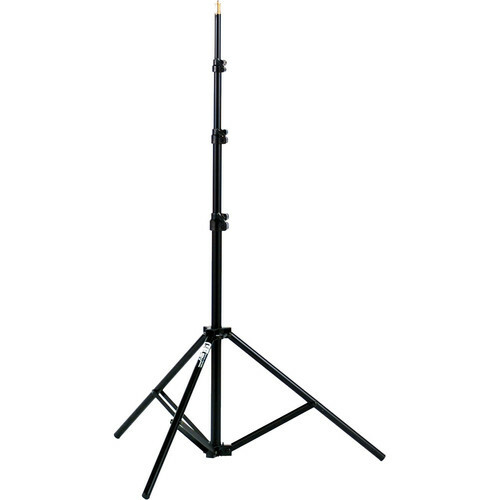 Box Dimensions (LxWxH) 36.0 x 3.5 x 3.5"
RS8 Aluminum Light Stand (8') is rated 4.6 out of 5 by 22. Rated 5 out of 5 by Westcorner Studios from Great Stand for the money I use this light stand for my Nikon SB900 Speedlights. I also attach a shoot through umbrella to the stand. These stands are great for this purpose! I would recommend using sandbags on the legs when shooting outdoors. If you are looking for a super tough, beat it against the wall stand you will need to spend some more money. However if you need some stands to travel with for portraits and on-location shooting and you want light durable and easy to use stands, these are it. Rated 5 out of 5 by Claude K. from Great general purpose light stand I use this to mount a Smith Victor Q60SGL 600w FILL LIGHT w/BRNDR & LAMP. I also use 2 of them in conjunction with a curtain rod to hang a green screen. Rated 4 out of 5 by George from Good stand, but . . . In terms of build, this is a good stand for the money. However, the one that I received had a defect - one that it was easy to correct, so I corrected it rather than wait out the turnaround time for a replacement. Both the distributor and B&H immediately offered to replace the stand, both demonstrating good service policies (standard practice for B&H). So this item would have had 5 stars had it arrived without the defect, plus, it hasnt been in service long enough to show how it will hold up, thus the 4 stars. Rated 4 out of 5 by Anonymous from Solid and Sturdy Used to house my 2*550EX Speedlites for wedding photography. Nice solid bases. Very well designed, constructed. My only complaint is one of them isn't smooth when it comes to pushing up the lower base. No biggy though, highly recommend. Rated 4 out of 5 by DDB from Sturdy, well-priced I am very happy with this item. I bought it to use along with the Smith-Victor boom arm and a 28 Westcott Apollo soft box. The 8' stand holds all of these items well. Now, I wouldn't take it outside, but it works great for studio use. Rated 5 out of 5 by Don The Liberal Democrat from Great Replacement Light Stand I purchased the Smith Victor Raven 8' Black Light Stand to use with my twenty year old plus Smith Victor Model 750 1000 Watt Light. This light was part of an older lighting kit which I had not used for several years. Somewhere along the way, I had lost one of the original light stands. The twists and turns in my career path has led into event videos (primarily piano and other musical recitals). The inadequate lighting in the recital rooms, smaller halls, and churches has forced me to bring in my own lighting. Since I still have one of the original lighting stands in the kit, I could directly compare the two. The Raven has considerable more base stability than my original stand. While I am still more comfortable using sand bags, I am not in Panic City without one on this stand. There is virtually no perceptible difference in the weight between the old and the new stand. The only thing that needs improvement is the mounting tip. My old stand has an adapter which covers the mounting tip and provides more stability to the head. I cannot remember if this was original equipment or something that I added. Rated 5 out of 5 by Anonymous from Great Stand Use this with 45 shoot through umbrella and it works like a champ. Only thing is that the way the legs fold out they won't lay flat for the times you want it at it's lowest position. Very sturdy.